A much-anticipated all-party meeting fails to put an end to the latest fast by activist Anna Hazare. There seems to be no light at the end of the tunnel of Anna Hazare’s confrontation with the government. The much-hyped all-party meeting convened by Prime Minister Manmohan Singh proved to be an ambush for Team Anna and a success for the United Progressive Alliance (UPA) government as virtually all parties told Hazare what the government has been saying for months: that parliament is supreme and some of the provisions of the Jan Lokpal Bill (drafted by Hazare’s associates) are therefore unacceptable. Party leaders were unanimous in dismissing Team Anna's strident demand of a deadline for the tabling and passing by parliament of the Jan Lokpal Bill as unacceptable. Significantly, the main opposition Bharatiya Janata Party firmly opposed Hazare's demand for having Lokayuktas (chief ombudsmen) in every state. Singh indicated that his government wasn’t in favour of withdrawing the Lokpal Bill it had introduced in parliament on August 4 – a major pre-condition set by Team Anna. He admitted that the government was in a bind, though, over how to proceed. 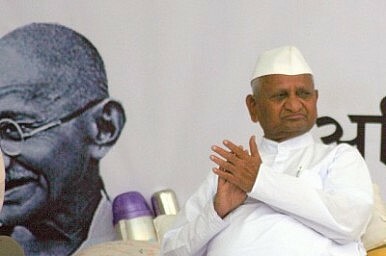 Hazare, meanwhile, continued to pressure the government, with Team Anna declaring he was healthy enough to fast for nine more days. ‘My fast has entered the ninth day. Nothing will happen to me. I can fast for another nine days. We will fight together,’ the 74-year-old activist said amid thunderous applause. The government has made a new offer to Team Anna and proposed bringing the prime minister and the Central Bureau of Investigation (CBI) under the Lokpal ambit, but keeping the higher judiciary, lower bureaucracy and MPs’ conduct in parliament out of Lokpal’s purview. The government offer promises to pass the new bill in the current session of parliament, even if the parliament session has to be extended by a few weeks. As for the government, it has made it clear that passing the Lokpal Bill in the monsoon session of parliament, as demanded by Hazare, isn’t possible. Still, the government has taken a big step forward on the issue, and union minister V Narayanasamy said the Department of Personnel had forwarded the Jan Lokpal Bill to the Parliament Standing Committee for consideration. Communist Party of India (Marxist) leader Sitaram Yechury said that the government had agreed to withdraw the Lokpal Bill and introduce a new and stronger version. The BJP’s Sushma Swaraj, who is also the Leader of Opposition in the Lok Sabha, claimed that the government was reluctant to withdraw the Lokpal Bill. UPA to Blink Over Lokpal? The ruling UPA alliance looks like it might be about to give ground to Anna Hazare over the Lokpal Bill. Anna Hazare Going Too Far?Congress Under SiegePolitical Paradise Lost? India’s Election WarningAnna Hazare a Hindutva Project?